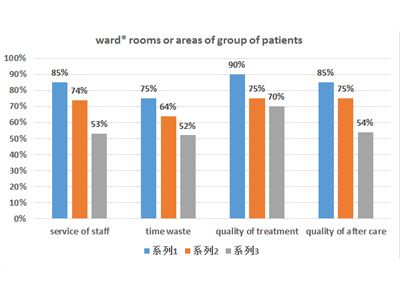 小作文题目：The bar chart shows the results of a survey about different wards of a hospital and the percentages of patients who think “very good” of the experience of the hospital.Summarize the informationby selecting and reporting the main features，and make comparisons where relevant. The bar chart compares satisfaction rates of patients from three wards of a hospital in terms of four respects，as illustrated from a survey. Generally, Polly ward performs the most extraordinary as the maximum proportion of patients think highly of its service of staff, time waste, quality of treatment and after care. It stands in marked contrast with Oak Ward which receives the least praise. Specifically, the vast majority of patients (90%) are very satisfied with quality of treatment provided by Polly Ward, exceeding its service of staff and quality of after care by 5% while three quarters of people favor its time allocation. Turning to Maple Ward, three quarters of people like its quality of treatment and after care while the service of staff is marginally less preferable. Also noticeable is that the least number of people (64%) are content with its time waste. By contrast, the situation becomes barely satisfactory in Oak Ward, with merely more than half of people enjoying its three aspects of service except quality of treatment which gained satisfaction from 70% of patients. Overall, among all the three wards, quality of treatment and after care are the most favorable aspects of service while the other two aspects are less popular.